According to a recent University of Tennessee study, children who play on natural playgrounds—otherwise referred to as playscapes—tend to play longer and stay more engaged than those who play on the brightly-colored equipment that graces most playgrounds these days. Why? They’re using their imaginations and motor skills more. Kids know what to do when they see a set of monkey bars. But, it’s up to a child’s whim to decide whether they should dig, stack or build a fort with a pile of sticks. The key elements of a playscape can be incorporated into any outdoor living space. With modern technology, safety concerns and development of natural space into housing, many kids these days are confined to city and school playgrounds versus taking the types of risks outside that were considered normal for their parents. Playscapes involve as few man-made parts as possible but, as you’ll see, nature provides plenty of options. 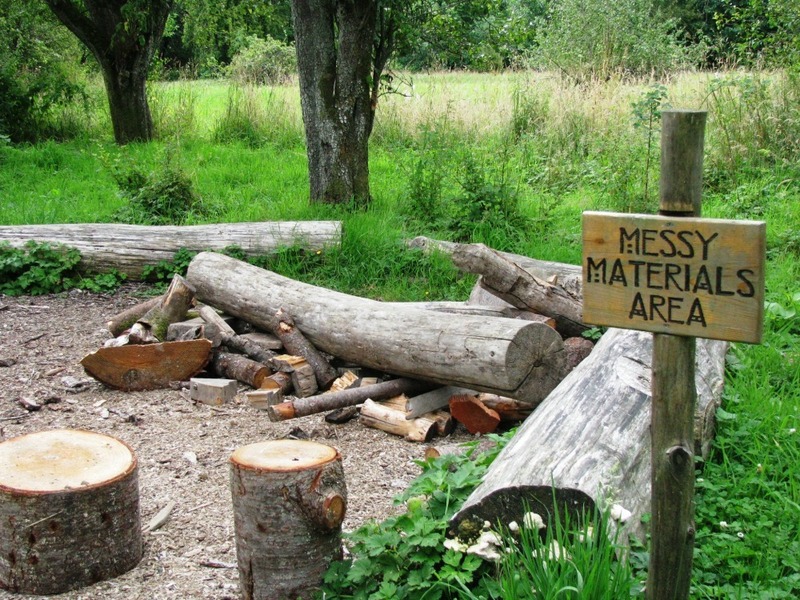 The natural materials and elements in a playscape serve multiple purposes and there typically is no central focus point, which experts believe decreases competition and risk of bullying. According to Wikipedia, playscapes also help increase attention spans, improve social skills and do a great job of showcasing environmental stewardship. A playscape doesn’t need to monopolize your outdoor design. Think about converting an underutilized side yard or backyard corner into a natural play area. The upshot is that it will blend in much better than a red, yellow and blue slide and at a lower cost than buying actual playground equipment. And, after your playscape is installed, take it a step further by showing kids how to backyard bird watch or get them interested in gardening. We break down some of the possible components below. Bury boulders securely in the ground so they don’t tip over as kids jump or step from one to the other. 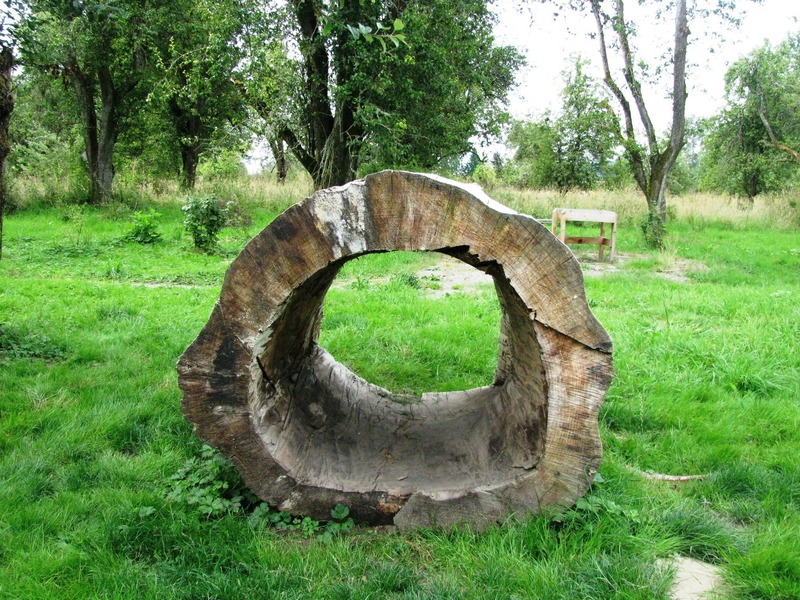 Re-purpose a removed tree by using stumps instead. Kids love paths, but this kind can double as little tables or whatever their hearts desire. If renovating your outdoor living space, think about re-purposing extra dirt into a small hill or multiple little hills… the steeper, the better. The opportunities for imaginative play are seemingly endless. Not only is a hill fun to roll and slide down, it’s something to ride bikes over (provided you have the space) and make the centerpiece of a variety of games from tag to hide-and-go-seek. Dirt is also fairly inexpensive to buy, if need be. No formal sandbox is necessary. Dump some sand in a pile or muddy up some dirt to create an area where kids can get a little messy by digging. If you’d like to contain the area, place a border of stumps or big stones around it. Be prepared to replace the sand as necessary, if it isn’t contained well—there’s no hard or fast rule that says it has to be. Fun to stand on, (safely) jump off of and take a seated break on, boulders or big rocks provide great additions to playscapes. Kids can drive toy trucks over them or even use washable chalk to color tic-tac-toe or other fabulous artwork all over the sides. 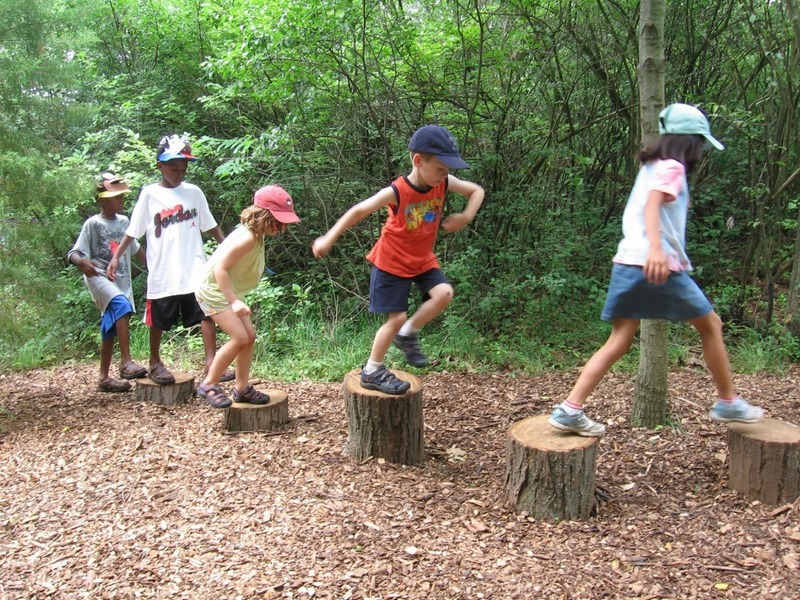 Studies have shown that balance beams are important yet fun activities for kids. The mere act of balancing teaches kids the concept of sides (awareness of left and right are important pre-reading skills) and also makes them aware of where their body is in a certain space. Experts suggest the latter helps kids learn the ability to sit still in class and remain stable in chairs. Find a log and stabilize it on the ground. An effective balance beam doesn’t need to be a tall one. Plant some tall grasses or native plants around a patch of sod to give kids some natural privacy to play games or hang out. Make sure the surrounding plants aren’t so dense that you can’t see what the kids are up to. Areas like these help improve listening skills, because kids may not be able to see entirely around them. Small scraps and rocks serve as building blocks or props for imaginative play. A sawed-off tree stump makes an excellent base for a mini teepee as well as a plate to serve pretend meals on. It’s likely that your child will eventually add his or her own loose materials to the pile. The more, the merrier! Similar to an hiding spot, partially-concealed shelter is cooler than a plastic playhouse. Build a teepee using bamboo and drape burlap over the sides. Or, grow a vine as walls. Vegetables like green beans make excellent and edible candidates. If incorporating a number of the concepts above, the terrain in a natural playspace will automatically be varied and become a valuable aid in building gross motor skills as kids run, jump and roll through it. It’s thought that kids fall less when playing on natural, varied terrain because they are more aware of their surroundings. Watching my daughter climb trees–a rare privilege these days–is one of my least favorite activities due to the stress and worry it causes me, which is totally ironic since I spend my childhood exploring canyons and climbing random trees on a ranch north of Santa Barbara. Climbing trees, it turns out, is a highly cognitive activity–more so, perhaps, than anything else mentioned so far. Kids need to merge their desire to climb the tree with their actual ability to do so between the brain signaling their bodies with each movement and figuring a proper path to victory (branch support, reach and the like). This isn’t a mandatory addition, but is one that some parents are comfortable with. It’s important to be mindful of critters (speaking of critters, if you have the space to provide some distance between kids and bugs, a bug hotel in the corner of a playscape would be an awesome natural addition) that may be hiding underneath piles of sticks and what have you. Supervision is imperative here, just as it is on any other playground. Playscapes are also designed to eliminate heights and fall risks (climbing trees aside). 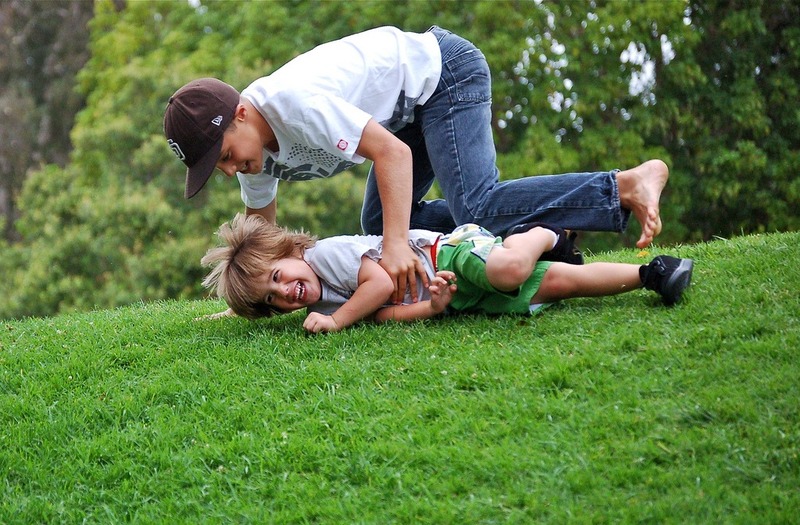 Kids will tumble, get dirty and have a great time… just like you did as a kid. Do you incorporate playspace into your backyard?